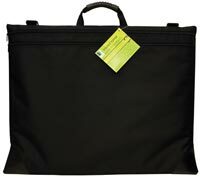 The canvas art supplies Double Zipper Artist Portfolio features a removable and adjustable shoulder strap with a no-slip shoulder pad, an ergonomic, comfort grip handle, and reinforced, bound seams for added durability. Cheap imitation leather corner reinforcements provide stylish strength and two large zippered compartments create separate storage options for the working artist. The make a great transport bag for custom picture framing. They are made of opaque water-resistant nylon and generously sized two inches larger than stated dimensions in each direction.